Journalist Mukarram Khan was praying when men fired at him thrice, one of bullets pierced his body and injured Imam also. In 2001, just after the US invasion in Afghanistan, a tribal journalist from Mohmand Agency was captured near Kandahar along with another Pakistani and a French journalist. All three were taken into captivity by the Afghan Taliban on suspicion of being American spies. As their case went before the Taliban court, the tribal journalist found himself with an unexpected advantage; he was the only one who could understand both English, Urdu and Pushto. Thus, he entered into the unlikeliest contract of all; working as a paid translator for the Taliban while in captivity. At the end of the three months which marked the end of his ordeal, the tribal journalists had earned around Rs 30,000 from the Taliban. 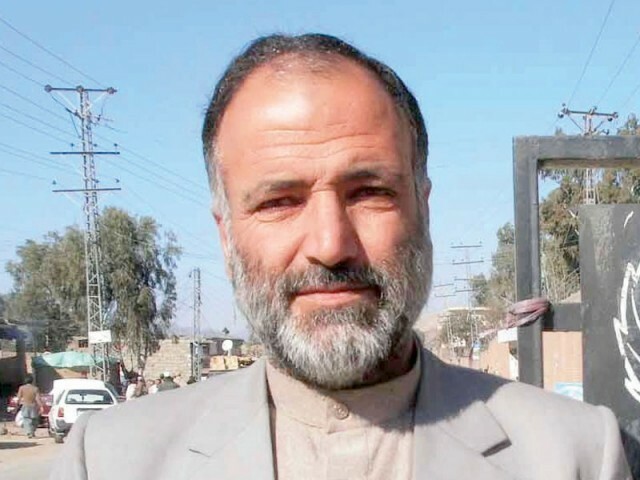 That is how I knew Mukarram Khan – the only journalist to have actually made money while under Taliban captivity. Sadly, the same man who outsmarted and survived the Afghan Taliban for three long months could not save himself from our home grown monsters. The Tehreek-i-Taliban Pakistan assassinated Mukarram Khan yesterday for not giving them enough coverage. Last year, Khan had to leave his hometown in Mohmand due to constant threats to himself and his family, but rather than moving further away, he chose to remain in Fata and continued to dispense of his duties as a journalist from Shabqadar, Charsadda. He worked as a correspondent for multiple national and international news outlets. I knew him only for a short week; but he changed my own stereotypical perspective of what tribesmen are usually like. His experiences in the conflict zone showed me how little we really get to know of the brutalities that Fata residents face. His passion and dedication to the profession was unmatched. But the most amazing thing about Khan was his spirit; with experiences harsh enough to turn anyone into a jaded, bitter, brooding robot, Khan not only managed to come across as a positive, soft spoken person quoting Faiz and Ghalib, but was also progressive in ways we normally do not associate with the men of the tribal belt. Having known him personally, it pains me to put Khan in the context of gory statistics; but here is the heart breaking fact – he is the first one to have perished in the line of duty this year, but in all, he has simply joined the long list of Pakistani journalists who have been killed after the start of this so-called war against terror. Like all those who went before him, Khan’s untimely death has brought along messages of condemnation and sympathies from the rulers and journalist unions. However, as always, there isn’t any effort being made to find the assassins and bring them to justice. In the beginning of December 2011, I heard the Federal Secretary Information speak at an International Conference regarding safety of journalists. He not only refrained from giving any concrete answers to the question of impunity, but also claimed to have no knowledge of the fact that around 20 journalists have been killed in Balochistan. DG ISPR, Major General Athar Abbas who also made an appearance gracefully placed the burden of killings on the victims themselves, accusing them of “not informing the security forces” when going into danger zones. I’d like to ask him, exactly who should have been informed when Mukarram Khan went to a mosque to pray. I’d like to ask Mr. Rehman Malik, whether we need another commission simply to determine the fact that, yes, Mukarram Sahib was murdered. As for the information secretary, I’ll wait till he happens to visit another event where he can be informed of Khan’s tragic passing. But the anger directed at the government authorities cannot match my disappointment with the media outlets, associations and unions. Like the murders before him, Mukkaram Khan’s demise is also being treated simply as a sensational story; a story whose airing might help generate support for his grieved family, but a story that is missing context and accountability nonetheless. There has been a mention of previous murders, but hasn’t been any pressure to actually end impunity. Every single day, we see Kamran Khan and the likes busting their nerves screaming about the ongoing political crisis; but when it comes to issues that really need their relentless, passionate attention, we see them falling quiet or mentioning them simply as an afterthought. Saleem Shahzad’s murder was touted as a turning point in this culture as we saw the media fraternity sitting together to demand an investigation. But the utterly useless result of the investigation has failed to rile the media. If things remain same, Mukarram Khan’s murder will only mark the beginning of yet another bloody year for journalists in Pakistan. I’m sorry, my Pakistani friends, but Mr. Rehman Malik can not be trusted. He reminds me of the old American television sitcom, Hogan’s Heroes, where the bumbling, incompetent Colonel Klink thinks he knows all and yet does not have a clue. Poor Pakistan. He constantly lies, spouts disinformation or outright falsehoods. For some odd reason, I now feel sorry for Mr. Hakeemullah Mehsud. Several times this simpleton has reported on the demise of the Taliban leader, only to have the same show up and mock him. This time he says he is not sure he died in a drone strike. Uh-oh for Mehsud. God bless you Sadaf ! Thanks Sadaf for your homage to Mukarram Khan. I was waiting for one to come in the last 24 hours. I am shocked at the complete silence elsewhere at his death. Nothing in op-eds, just a reprint of what was released by VOA. All that has been there has been a “condemnation” by the union – Mukarram Khan deserved way more than that. When I read of his death online last night around 11.30 pm, I actually dialled his number to confirm it. A male relative picked up the phone and said that indeed it had happened. All I could do was mumble my condolence to him and his family. I am still stunned. Two years back while I was still working at a local monthly, and the operations in Fata and NWFP were at their peak, he was a veritable source of information. I remember speaking to him so many times on the phone over many many months, asking him for updates which he willingly gave without any hesitation. Nothing asked in return except for anonymity because he feared for his life for what he was telling. Like so many others reporting from the tribal areas. At the desk, you are sitting miles and miles away, and so when you come across a person who is not from your news organisation yet his information is always solid and reliable, you realise their true value. His death is tragic. Rarely do you find journalists who work for their people, and their land. May be he couldn’t pen a sentence in English, which has become the bar for deciding who a journalist is lately, may be he wasn’t as high profile as Saleem Shahzad or worked as closely with the ‘right’ kind of journalists but this man put in a lot of effort into his work. When most people had fled Mohmand, he stayed back and would visit it to check on how his area was, how the people who refused to go away were, what was happening in the midst of the operations. Journalists get what they deserve. They should’t meddle in things that don’t require attention.